We are a luxury B&B with affordable pricing. Those with very discriminating tastes asked why pricing was so low for what we offer. This is a private retreat all rooms have their own ensuites. Every room has a view. You can mingle or you can escape. 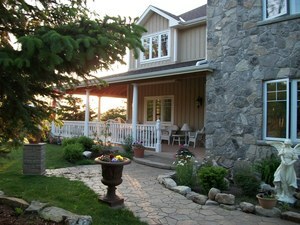 There are many verandas, balconies and nature trails/wineries/restaurants/attractions in the area. Biking, fishing, exploring the region is part of your magical experience. Everyone comes back so it meets many expectations and some say it exceeded their expectations. Reservations when requested. Drives to and from dinner. We are surrounded by 23 Wineries some within walking or less than 10 minute drive. Our gourmet breakfasts are a hit and our very relaxed quarters amaze our guests. Our quality and nourishing breakfasts start with fresh fruit/eggs anyway you like bacon sausage. Potatoes/hash browns rolls/croissants/healthy options too. Usually we bake but if there is something you like let us know as we have stopped baking muffins as hardly anyone made his a breakfast choice. We have fresh pancakes and waffles. We will try to provide most of your favourites just ask ahead so we can plan ahead. We do vegetarian and Gluten free let us know in advance. Juices standard unless you prefer something special.